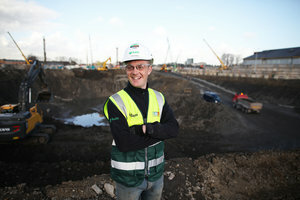 Ross Burns (21) from Inchicore is working as an Engineer’s Assistant on the new children’s hospital. 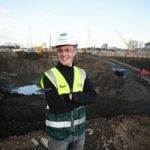 270 person years** of employment (14,000 work weeks) to be delivered by new entrants over the remainder of the construction. 33% of contracts in enabling works awarded to companies in Dublin 8 and 12, and 92% from the wider Dublin area. Community Benefit Programme Manager with the National Paediatric Hospital Development Board, Ingrid McElroy, this week provided Dublin City Councillors with an update on the programme of activity that is underway to maximise the benefit to the local community from the new children’s hospital being developed in their area. In 2015, an independent report commissioned by the projects Community Benefits Oversight Group*** called Harnessing the Potential identified a wide range of areas in which the local community will benefit from the project and set out a series of recommendations to ensure that they were realised and maximised. The inclusion of an innovative Community Benefit Clauses in all project-related construction contracts with employment targets for long term unemployed and new entrants is ensuring that local people are benefiting directly from employment opportunities. During the initial yearlong enabling works, where the community benefit clause was piloted 4 new entrants representing 10% of the construction workforce – have been employed in roles such as engineers assistants, site administrators and general operatives (for a total of 147 work weeks) and continue to work on the project. An additional 14 people from Dublin 8 and 12 were also employed for 300 work weeks. A key element in the strategy is the active connection to the local employment and training bodies. The NPHDB is engaging on an ongoing basis with the CDETB Colleges of Further Education and training agencies to maximise potential work experience placements and to investigate how training provision can be refined to match employer needs. A Recruitment Pathway has also been devised and agreed with Intreo on Cork Street and Local Employment Services (LES) Dublin 12/8 where all vacancies including with subcontractors are advertised. As well as providing employment and business opportunities in the short-term, initiatives are ongoing to raise aspirations through education, encouraging children to consider careers that will be provided by the hospital both during the construction and operational phase. The second annual careers day looking at the jobs in design, engineering, and construction will take place during Engineers Week on February 27th. Staff of the NPHDB delivered a 6-week ‘Engineering in a Box’ programme in local schools in 2017, bringing the profession to life in the school setting. An innovative health science programme is also currently being developed which, while focused on health science and health education, is designed to encourage an interest in healthcare related careers. ***In 2015 a Community Benefits Oversight Group was established to drive the agenda comprising all of the relevant stakeholder groups in the community to endure that all opportunities are fully leveraged. Members include; St. James’s Hospital; Dublin City Council; Department of Social Protection; CDETB; HSE; local development partnership companies and community networks; and independent Chairman Gordon Jeyes.